sky slowly turning crimson. This has become a routine now for many years. The sight of two lovely ripe lemons that lay on the gravel added to the happiness. The lemon tree had been planted many years ago and had grown older with passage of time. It is like a parent that has nurtured us .What better tribute to my father who was born this day and had loved nature perhaps more than I do. He would take immense pride in showing the garden to the visitors and heaping praise on the quality of yield just as if the progeny had topped an examination. The sight of lemons in the morning is also a reminder that these fruit are a result of hardship and pain that a parent endures. The request for trimming the branches by the neighbors in winter months is painful as the merciless chopping of the additional branches is difficult to endure. The plant never fails to yield the fruit most times of the year, regardless of the trauma we inflict on it. A gentle sprinkle of water on its leaves and branches deposit small droplets of pearls that shine to make each morning a special one that raises the spirits. It is difficult to pluck the fruit without bruising the hands by sharp needles of thorns that surround it. 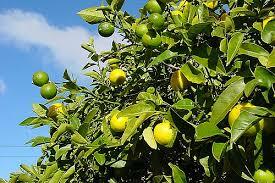 The beautiful song sung by Trini Lopez best describes the beauty of the Lemon Tree. The fruit was shared with relatives and neighbors who devoured it with equal glee. The endless flow of the fruit during the season helped in preparation of pickles, juice and chutney for the remaining months. One never feels lonely in such a pristine company. The pleasure of tending to the plants and trees is unmatched. It provides an instant connection with the divine. The swaying bushes and flowers with weight of pecking birds and bees are perfect stress busters. As the sun sets in the west the perfect calm returns except for occasional chirp of birds retiring with their families .The magic begins each day without fail with the break of dawn. True, the pleasure of tending to plants and trees is divine. Thanks for reading atomic ham and sure tending to the plants is divine! I can smell the lemons from here! Loved your beautiful description! Thanks a lot LadyFi for the lovely comment. Beautiful story of the Lemon tree...your father had a green thumb, I think. Even the leaves smell great. I have seen many birds feeding on the flowers of the lemon tree. You are very lucky! Thanks a lot for that kind comment Sandhya. I am truly lucky to have a lemon tree in the backyard. "The plant never fails to yield the fruit most times of the year, regardless of the trauma we inflict on it." I've had plants only the last few years and I totally relate to the maternal feeling we have towards them. Absolutely Purba with smaller plants one feels like tending to children and with bigger trees it is like treating elders. I know what you mean Rahul.Plants tended by us are no less than our kids.And when a plant reminds you of your father then it is very special. You took me back to my childhood days when I was in love with my garden and used to spend so much time there. Serenely penned. And you said it perfectly: The pleasure in tending to plants is unparalleled. Thanks Raj! Anyone that has stayed close to Mother Nature can best relate to this. I always envy people who have a green thumb and who love gardening. I agree with you that the pleasure in taking care of plants and trees in unmatched. Being in contact with nature is divine! You sound like my parents. They love their trees, pots and plants. They take pride and make countless trips to our relatives to distribute the produce. I know how harsh it is to chop the branches for sunshine. Been there, heard that. Ha ha... Thanks Saru that my thoughts reminded you of your parents:) Anyone who loves plants feels that way. I wish I can be reborn as a tree always! The last paragraph touched my soul since thats what I always think of my time in my garden. Very beautiful post Rahul. Lovely! joy of sharing and growing one's own food. Awesome! Thank you Bindu for liking the post.